Question: How do I handle upgrading the septic system if I am adding a bedroom onto my house? 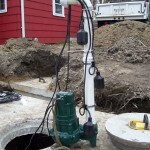 Hire a licensed engineer and a licensed septic installer. The engineer and installer perform tests on the property to ascertain the septic capacity of the property. If the property passes the tests for an expanded system, the engineer then designs a new septic system. The engineer, installer and Board of Health rerun the property tests together and the engineer submits the new septic design to the Board of Health for approval. The Board of Health then reviews the test results and the proposed septic plan and either makes modifications or approves the plan as is. The licensed septic installer then proceeds to install the new septic as designed and has the system inspected by the Board of Health at specified intervals during installation. 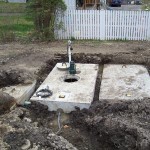 As licensed septic installers, Precision Excavating Inc., can walk you through the process of expanding your septic system. Question: Can I just make my septic tank larger and then add a bedroom on to my house? Answer: No. Your fields actually handle all the water from your home, so your fields would need to be enlarged. See process from the question above. Question: Do infiltrators require gravel? Answer: The infiltrator system specifications state that infiltrators can be laid without the use of gravel in septic soil or optimum soil conditions. Most properties do not have optimum soil conditions, therefore, many people experience infiltrator septic system failure when the infiltrator system is installed without the use of gravel. We at Precision Excavating recommend infiltrator septic systems be laid with gravel to allow for proper soil penetration. Question: Do we need an engineer to repair our septic system? Answer: In both Westchester and Putnam counties licensed installers such as Precision Excavating Inc. are allowed to repair septic systems that are in failure utilizing an “in kind” replacement without the use of an engineer. “In kind” means that the system will be placed in the same location and be the same kind as the original system. If the system needs to be significantly altered and put in a new location, then an engineer is required in Westchester and Putnam Counties. Question: What is a pump system and when is it required? 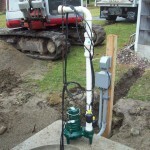 Answer: A pump system is one which includes a series of two septic tanks. The second tank has a pump which disperses the waste water at intervals. Such a system is required when: 1) the waste water needs to rise to a higher elevation than the tank; or 2) to increase the flow to the fields in larger systems. Question: What does “machine grade” mean? Answer: A machine grade is a rough grade that is only done with the machine. 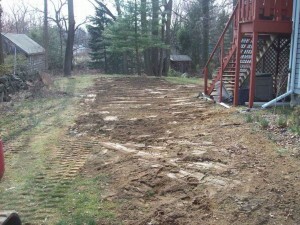 The surface will look level but the rocks and some ruts will not have been raked out. 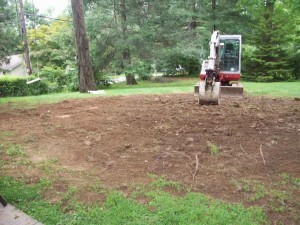 Before planting a lawn (which is a vital for the proper functionality of the septic system), the ground requires hand raking and removal of the rocks. This can be done by the homeowner, a landscaper or Precision Excavating Inc. can give you a price for a new lawn installation.